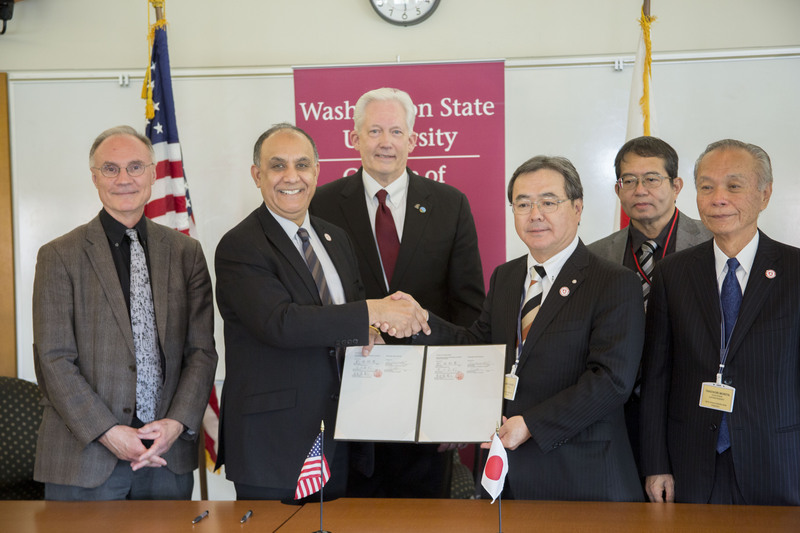 Washington State University and the College of Education have signed two Memorandums of Understanding with Okinawa Prefecture city and educational leaders, to pave the way for more Okinawan students to attend WSU. In consecutive signings, vice president for international programs Asif Chaudhry was the lead authority from WSU. The first signing was a program renewal that will bring secondary education students to the WSU campus in July for an immersive three-week experience. The Okinawa American Language and Culture Camp was housed under the Intensive American Language Center, but will transition away from the IALC and toward the College of Education. “Our hope is to have even more programs with Japan, and, in this case, get even more Okinawan students,” said Paula Groves Price, the college’s associate dean for diversity and international programs. As part of this renewal, associate professor of literacy Jane Kelley will spend a week in Japan in August also teaching English. The other MOU was between the College of Education and the Kitanakagusuku Board of Education, for the Online Developing Okinawa Through English (DOTE) program. Using web conferencing and other technology, students in that Japanese school district will take part in a series of weekend classes to help advance their language acquisition and use. Dean Mike Trevisan represented the College of Education in the signing.